Sakai Guides and DocumentationSakai Complete User Guide LessonsHow do I add text to a Lessons page? Instructors can add a text box to any point in the Lesson Page. Click Add Content, then Add Text. Alternately, click the + button and then Add Text. Zoom: Alternately, click the + button and then Add Text. You may also add content by clicking on the + button next to any existing item on the page. Zoom: Enter your text content. Use the Rich Text Editor tools to format the text. When finished, click Save. Zoom: View content on page. After saving, you will return to the Lessons page with the new text displayed. 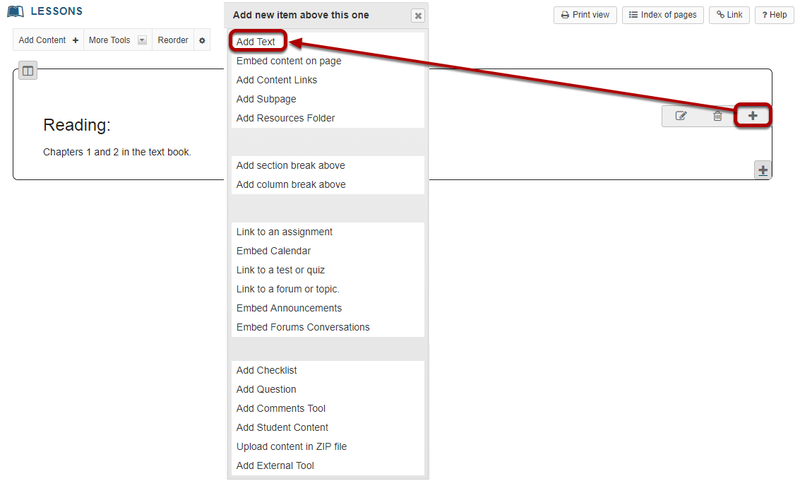 Note: The Lessons tool descriptive help text disappears from the page after content has been added. Repeat the steps above to add more content items to the page. In the example image above, an initial text box was followed by a second text box which included an image and text. Tip: Text boxes can be added at any point in the Lessons Page. You may want to intersperse text items with other types of Lessons content, such as images, embedded video, assignment or assessment links, etc. Prev: How do I create a new Lessons page? Next: How do I embed an image on a Lessons page?